Illa (Dorsey) Coffey, age 90, passed away on May 19, 2014, at Oak Gardens with family by her side. Illa was born January 13, 1924, in Leon, Iowa, and was the middle child of three. Illa received a degree in Library Science from Drake University, Des Moines, Iowa. She married Darrell Coffey in 1945. They were married 69 years and raised five children. They settled in Omaha, Nebraska, and later Menomonie, Wisconsin. 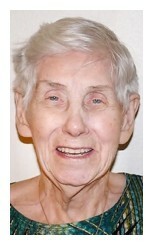 Illa was a school librarian in Ralston and Omaha, Nebraska, and worked in the UW-Stout Library. Illa is preceded in death by her parents, Neva (Curry) and Orange Dorsey; sister, Evelyn Gleaves; and brother, Leland Dorsey; and by her Auntie, Eva (Curry) who was a beloved second mother. Illa is survived by her husband, Darrell Coffey; daughters and son, Carla Schoenbaum, Cindy (John) Glowaski, Diana (David Burke) Coffey, Matt (Nancy) Coffey, and Melissa (Will Brown) Coffey; grandchildren, Tasha, Kim, Jen, Ashley, Lexi, Emily, Theresa, Frieda, and Kelder; and great grandchildren, Shaylyn, Aaiden, Tyler, Bain, Alaina, Jackson, and Dylan. Illa kept family at the center of her life, taking her children to music lessons, play practice, and swim lessons. She led Campfire Girls groups for each of her daughters, and was the superintendent of Sunday School. When her children were adults, she loved to take them out to lunch, and frequently helped with her grandchildren. Illa regularly donated teddy bears to the Dunn County Sheriff’s Department for small children who found themselves in police cars, and she volunteered at the Stepping Stones Food Pantry in Menomonie. As a resident at Oak Gardens, she found ways to be helpful, setting the mealtime tables, and helping other residents in any way she could. Illa was admired for her optimism, intellectual curiosity, and need to give support to those less fortunate. The family wishes to thank the staff at Oak Gardens and Oakwood Villa in Altoona, and Dr Jeff Shepich and staff, Marshfield Clinic, for their kindness and care. A celebration of Illa’s life will be held, Sunday, June 22 at 1:30 PM for visitation and 2PM for the service, at the Unitarian Universalist Congregation, 421 S Farwell St, Eau Claire, WI 54701. Illa donated her body to the UW system for medical research. In the future there will be a burial of her remains in the Leon, Iowa Cemetery. In lieu of flowers, donations may be made to Stepping Stones Food Pantry in Menomonie; Planned Parenthood Federation of America or a local affiliate; or the Southern Poverty Law Center. Chippewa Valley Cremation Services was in charge of arrangements.